Riders at SEA can request Uber when leaving the airport. Learn how to receive these trip requests and cash in on the action. Per SEA regulations, driver-partners must adhere to the terms below. Failure to do so may result in the receipt of a citation or even restriction of access to airport trips. Please note that Uber will not pay for any citations that you may incur. If you receive a citation, the Port will allow a 10 day period for appeals if you believe the citation was unjust. If you fail to appeal or pay the citation invoice, these will be sent to Uber to pay the Port, however you will receive email communication and the corresponding amount will be deducted from your earnings. Commercial partners may fulfill requests for uberBLACK and SUV and may opt-in to fulfill requests for SELECT and uberXL. We’ve instituted a special first vehicle in is the first one out (FIFO) system at Seattle-Tacoma International Airport. The FIFO system only works within the designated, geofenced area and driver-partners waiting elsewhere will not receive trip requests through the Uber driver app. Driver-partners must have a valid Sea-Tac Airport permit (Gatekeeper). Driver-partners must have a valid business license. Driver-partners must have valid commercial vehicle insurance. Driver-partners may not wait longer than 10 minutes in the loading areas. Driver-partners must keep headlights on at all times. Driver-partners must not exceed the posted speed limit of 10mph. At SEA, Uber’s technology uses a first-in-first-out (FIFO) queue. This means that, in order to receive a trip request, driver-partners need to enter a designated waiting area, located within a “FIFO zone”. Driver-partners will then be placed in a virtual queue where the first driver-partner to enter will be the first to receive a trip request. 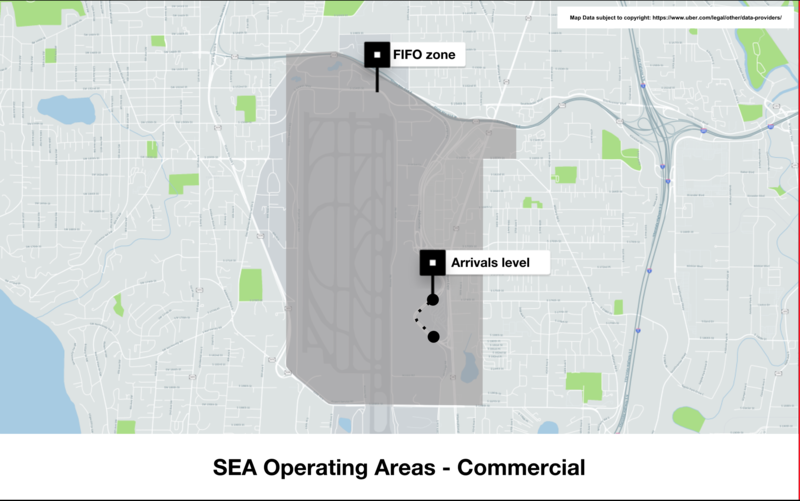 At SEA, the FIFO zone covers all airport grounds, as shown in the map below. 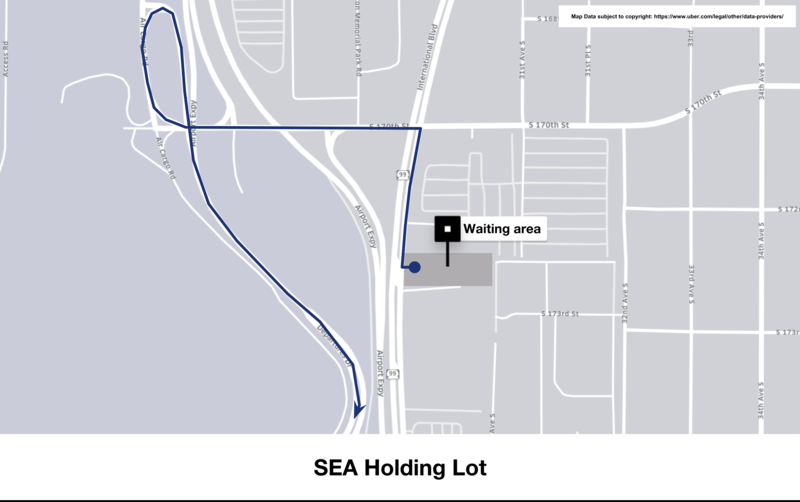 Commercial driver-partners are welcome to wait at our new holding lot located at 2902 S. 171st Street SeaTac, WA 98188. Once you accept a trip request, the pickup location at SEA is located on the lower level Arrivals drive (see map below). Based on the operating agreement with SEA, riders can be dropped off at the upper level Departures drive. If you’d like to receive a trip request afterwards, you’ll need to keep the Uber driver app on to maintain your place in the FIFO queue. Re-Match allows all partners who just completed an airport dropoff to temporarily receive a pickup request without having to wait in the FIFO queue. To qualify for Re-Match, partners must complete a dropoff at the airport. If you're in the terminal and do not receive a request after a few moments, it means there was no pickup available to rematch and you need to leave the terminal drives. If you don’t receive a Re-Match trip, you can still wait in the FIFO queue for an airport request. Please do not loiter in the terminal, as idling at the curb can still result in a citation. If you do receive a Re-Match trip, follow the route and use the south entrance to reach the pickup location on the Arrivals drive. You may want to call your rider to let them know that you are on your way! No. Partners will only be eligible for Re-Match after dropping off at the airport. Does Re-Match increase my wait time in the FIFO queue? During times when there are many drop offs the opportunity for Re-Match is higher. At these times the wait times in the FIFO queue may increase. However, Re-Match usually reduces the number of cars in the FIFO queue such that overall wait times generally remain about the same as before. What is the fastest way to go from Departures to the pickup location? 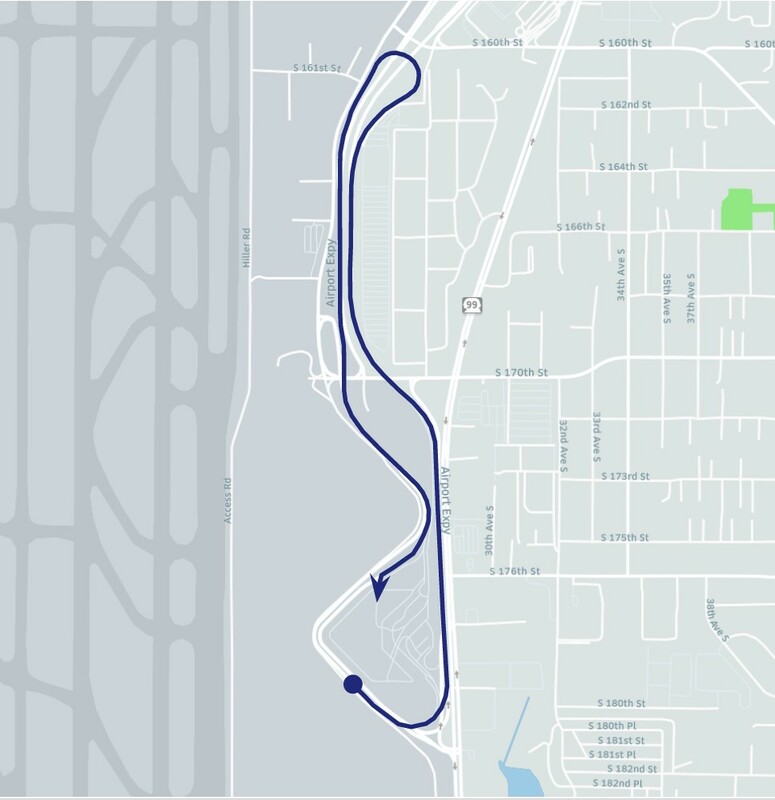 SeaTac Airport has requested that drivers use the Airport Expressway and the return to terminal loops to reach the pickup locations. Please do not exit on 170th street as those intersections can become very congested. I’d like to know more about Re-Match. Checking the arrivals schedule at Seattle-Tacoma International Airport can help you maximize your earnings with information about when flights will be landing at the airport and when it will be busiest. See SEA ARRIVALS SCHEDULE.